Spending on the day-to-day running of Scotland's rail network is set to increase. 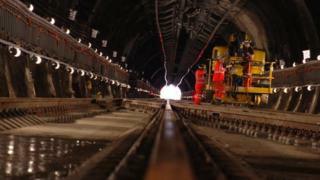 The money is designed to improve the performance of track and signalling, as well as reduce delays. The spending is part of a long term investment plan for Scotland's railways which now see more than 100 million passenger journeys a year. Over the next five years the budget for track maintenance and renewal work alone will rise by 21%. Track operator Network Rail will spend more than £4bn in Scotland over the next five years to help prepare the railways for a long term rise in passenger numbers. Funding for Network Rail, which builds and operates Scotland's railway infrastructure, comes in the form of grants from both the UK and Scottish governments. Transport secretary Michael Matheson will later outline the areas he wants to see Network Rail prioritise between now and 2024. Network Rail is currently developing a "pipeline" of projects which will allow ministers to choose specific schemes to take forward in the coming years, based on their cost and feasibility. Relieving overcrowding on the East Kilbride and Barrhead services. Improvements to the Portobello junction in Edinburgh to bolster the reliability of services to the Scottish Borders and beyond. Connecting the towns of Reston and East Linton to Edinburgh and beyond with two new stations. More services and faster journeys between major cities, including Perth, Aberdeen and Inverness, including "potentially extending electrification from Dunblane to Perth". Improving services to our rural communities on the West Highland and Far North Lines. Image caption More electrification projects, such as the one between Glasgow and Edinburgh which has allowed the introduction of the Hitachi class 385 train, are being planned. Transport Scotland said these projects have been "identified for development work and will progress through the investment decision-making stages" but added "the pipeline is flexible and other projects may come on stream. We cannot at this stage give a commitment to fund all projects through each stage of development or to delivery". As this pipeline work is undertaken, spending on track maintenance and renewal will be prioritised. The investment from Network Rail - which maintains more than 2,800 miles of track in Scotland - has led to the creation of 200 new jobs. Transport Secretary Mr Matheson said £8bn has been invested in the rail network since 2007. He also said the country saw the highest regional growth in the UK with passengers making 102 million journeys in 2017/2018. Mr Matheson added: "Despite the financial pressures imposed by the UK government, we have confidence in the future of rail. "Through our new projects pipeline we will address the cost and delivery challenges witnessed in recent years. "It will also give confidence to the rail supply chain, in that it assures a steady stream of work for the next five years." But the minister said he has been frustrated by having to operate with "one hand tied behind my back". He added: "Franchising, in its current form, doesn't work and we must use the opportunity provided by Keith William's review of the industry as a means of delivering real and meaningful structural change in Scotland. In its last funding period (2015 to 2019), Network Rail projects included improvements on the Edinburgh to Glasgow line. Franchise operator ScotRail has unveiled an improvement plan for its day-to-day services following a surge in cancellations in Edinburgh, Fife and the Borders.